Many animals were launched into space before astronauts to test the survivability. 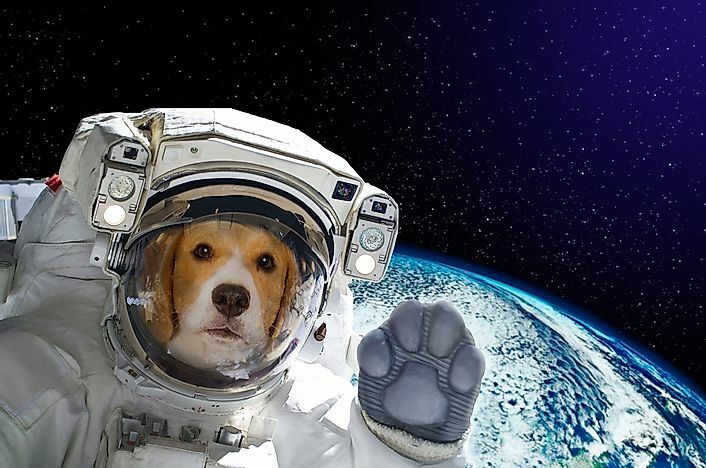 Several species of animals have been sent into space, including several dogs. Before astronauts went to space, they sent animals to space to test the survivability of life in spaceflights. Later, numerous animals were flown to investigate the effects of microgravity and the flight on them and various biological processes. To date, only seven national space programs have sent animals to space. These space programs are France, Iran, Japan, China, Argentina, the United States, and the Soviet Union. A wide variety of animals has been launched into space including insects, tortoise, and monkeys. The United States sent fruit-flies to space on February 20, 1947, on the V-2 rocket which was launched from the Missile-Range in White Sands New Mexico. The main aim of the spaceflight was to investigate the effects of exposure to radiation on the fruit-flies at extremely high altitudes. The V-2 rocket reached 68 miles within less than four minutes, and then it ejected the blossom capsule which deployed its parachute successfully. The fruit flies which were recovered from the V-2 rocket later were alive. The first monkey in space was a rhesus monkey known as Albert II. Albert II was sent to space on June 14, 1949, after the rocket carrying the original Albert failed to ascent. The first Albert monkey only managed to ascend about 39 miles before the rocket carrying him failed. Albert II reached 83 miles, and he died on impact after a parachute failure. The United States sent different monkey species implanted with sensors during the 1950s and 1960s. These monkeys were all under anesthesia when the rocket launched from the United States. The Soviet Union was the first country to send the first living animals to space. On July 22, 1961, the Russians sent R-1 IIIA-1 flight to space, but not into the orbit. The spacecraft was carrying two dogs, Dezik and Tsygan, and they were the first living animals recovered successfully from a space-flight. Although these dogs survived the first flight, one of them died on a subsequent flight. In response to this successful project the United States tried to launch mice on a spacecraft but did not reach the right altitude for an actual spaceflight. The Soviet Union sent another dog called Laika to space on the Spunit-2 spacecraft also known as Muttnik spacecraft. The Soviet United sent Laika to the orbit on November 3, 1957, on the second ever built orbiting spacecraft. The dog died on the flight as was intended since the Russians had not invented the necessary technology to navigate the spaceship while in orbit. Over ten other dogs were sent to space before Yuri Gagarin went to space on April 12, 1961. The first monkeys to survive the spaceflight were Able and Baker who were sent to space aboard the Jupiter-IRBM AM-18. On May 28, 1959, the spaceship was launched with a seven pounds American-born rhesus-monkey called Able and an 11-ounce squirrel monkey called Baker. Able and Baker were positioned in the nose cone part of the Jupiter-IRBM AM-18 which ascended to an altitude of 360 miles at a speed of 10,000 mph. These monkeys survived forces about 38 times more than the force of gravity and were weightless for approximately nine minutes. Although the monkeys survived, Able died four days later from a reaction caused by the anesthesia used when the doctors were extracting the infected electrodes from his body. Baker managed to live until November 29, 1984, and was in the media for months after the flight. Baker was closely monitored by her doctors who were keen to find out if she experienced any side-effect; she was even mated just to confirm if her reproductive system was still working. Ham was launched to space on January 31, 1961 in a Mercury capsule of a Redstone rocket. Ham was trained on how to avoid an electric shock and also pull the lever anytime he wanted to receive banana pellet rewards. The flight demonstrated his ability to do numerous tasks during the spaceflight, and his mission was the Mercury-Redstone 2. The United States finally sent another chimp called Enos to the orbit successfully on November 29, 1961. During the Voskhod project (the second Russian human spaceflight project), the Soviet Union launched two dogs to space on February 22, 1966, on the Cosmos 110 where the dogs spent twenty-two days before landing on March 16, 1966. Human beings did not surpass the record set by the two Russian dogs until the Soyuz-11 in 1971. The Soviet Union launched the first tortoises to space on September 14, 1968, onboard Zond 5. These tortoises were launched on a circum-lunar voyager with mealworms and wine flies among other biological specimens. These were the first Earth inhabitants in deep space and the first ones to travel around the moon. The capsule carrying these animals over-shot its landing site, but it was successfully recovered on September 21, 1968. The tortoises and all the biological specimens onboard survived, but they had lost some weight. The Soviet Union launched numerous Bion missions with numerous biological cargoes on the satellites. On some of these missions, the Russians launched Mummichogs, rats, and tortoises. The Soyuz 20 which was launched on November 17, 1975, had some tortoises onboard. These tortoises set a new record of the animals in space when they spent about ninety and a half days in space. During the FOTON-M3’s mission, the European Space Agency launched tardigrades (water-bears) to space on September 14, 2007. The water-bears were able to survive ten days of direct exposure to open space with nothing but their natural protection. The FOTON-M3 also carried some cockroaches inside a sealed container. The mission was successful, in fact one of the female cockroaches conceived while in space. After the cockroaches returned to Earth the female cockroach named Nadezhda became the first creature from planet Earth to produce a young one while in orbit.